Guts Boosts Attack if there is a status problem. "When this Pokemon has a major status ailment, its Attack increases by 50%." Emerald It has the habit of challenging others without hesitation to tests of strength. It�s been known to stand on train tracks and stop trains using forearm thrusts. Leaf Green It stomps on the ground to build power. It can send a 10-ton truck flying with a straight-arm punch. 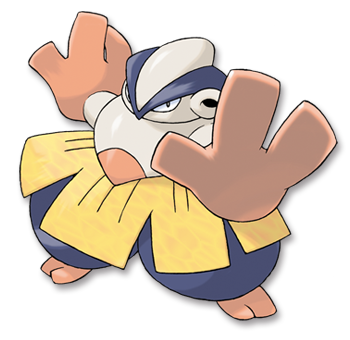 Diamond/Pearl It loves to match power with big-bodied Pok�mon. It can knock a truck flying with its arm thrusts. Platinum It loves to match power with big-bodied Pok�mon. It can knock a truck flying with its arm thrusts. Heart Gold It loves challenging others to tests of strength. It has the power to stop a train with a slap. Soul Silver It loves challenging others to tests of strength. It has the power to stop a train with a slap. Black It loves to match power with big-bodied Pok�mon. It can knock a truck flying with its arm thrusts. White It loves to match power with big-bodied Pok�mon. It can knock a truck flying with its arm thrusts.